When we think of chemicals, oil spills and toxic land, locales like Gowanus and Freshkills are among the first to come to mind. But all across the city are hotspots where spills have taken place. In an ongoing project called NYC Anthropocene, graphic designer and data guru Michael Appuhn is documenting all the areas where the city has seen these flubs since 2010, as well as some of the areas in Manhattan, Brooklyn and Queens storing oil, petroleum and various chemicals in bulk. While the map isn’t really anything to have a scare over—many of these are used for home heating or are fuel stations (although we won’t discount that spills can cause groundwater contamination including some public water supplies)—it’s interesting to see the distribution across the city. Want to have a closer look at your neighborhood? Michael invites you to shoot him a message for a zoomed-in version. RED: Petroleum bulk storage. Facilities that store more than 1,100 gallons of petroleum in aboveground and underground storage tanks or 110 gallons in individual underground storage tanks, with some exceptions. BLUE: Chemical bulk storage. Aboveground storage tank larger than 185 gallons, any size underground storage tank, with some exceptions, or in a non-stationary tank used to store 1,000 kg or more. BLACK: Major oil storage. Facilities that store a total of 400,000 gallons or more of petroleum in aboveground and underground storage tanks. 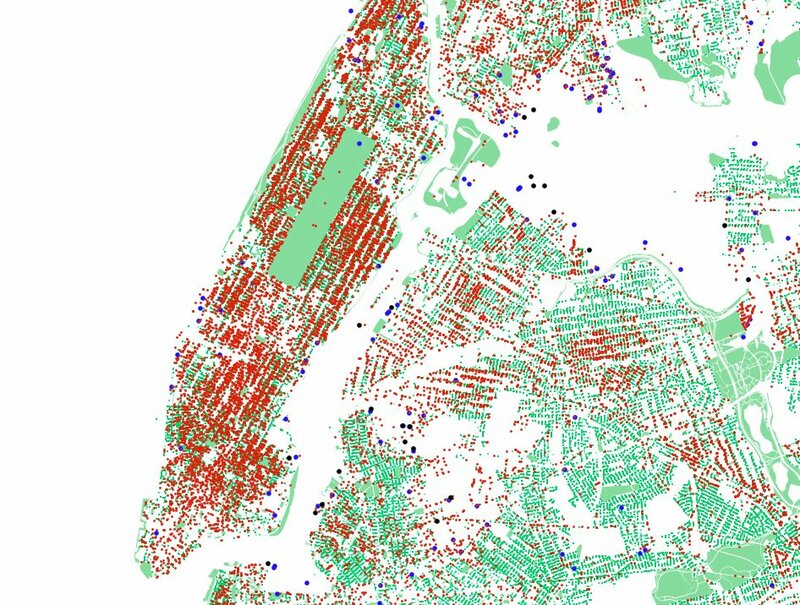 The data has been culled from the NY Department of Environmental Conservation and NYC Open Data. This story was submitted by a 6sqft reader. Want to see your project featured on our site? Shoot us a line at [email protected]!